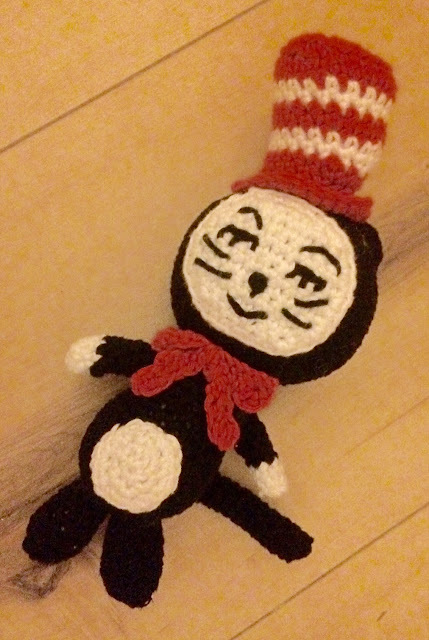 The Dr Seuss Cat is ready and welcomed with a lot of oohs and aahs by my oldest daughter, who is into cats. I used this pattern to make the cat. This recipe is on my Pinterest boards for a long time. What I like about the recipe is that there's no chocolate or cacao involved, because chocolate makes every hazelnut recipe taste like Nutella. Most people would cheer only at the thought, but I'm not very fond of Nutella. I got the recipe here. My Bunny Mug Cozy was featured this week by Scrapality, by Architecture of a Mom and by April J Harris! 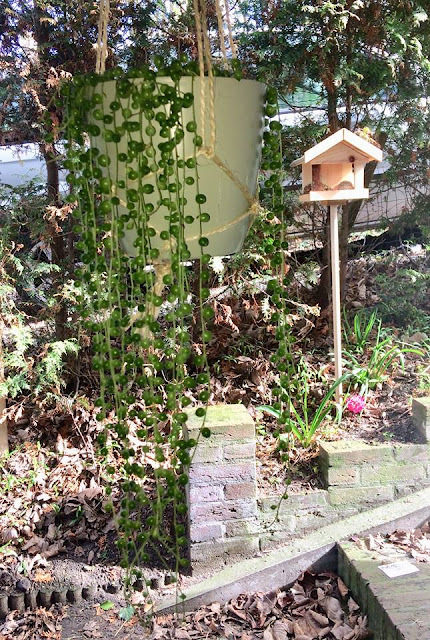 In the country I live in, The Netherlands that is, different regions have different traditions. If you keep in mind that The Netherlands are only about 42,000 square kilometers, I think that's marvellous. One of that regional traditions, or even town committed, is artisanal painting. Most of the time the paintings are flower themed, like this. Source . When I was a child, I think about twelve years old, I was fascinated by this kind of paintings and wanted it to learn myself. Not that I was from a region where artisanal painting was common, by the way. I wasn't particular interested in flowers either, so what makes this sort of painting interesting to me: don't know. For my birthday I got a book about how to make artisanal art, paint, pencils and something to smear the paint on, namely a wooden chopping board. For weeks I was busy painting everything made of wood I found around the house. Then I had enough of it and never ever thought about it again. 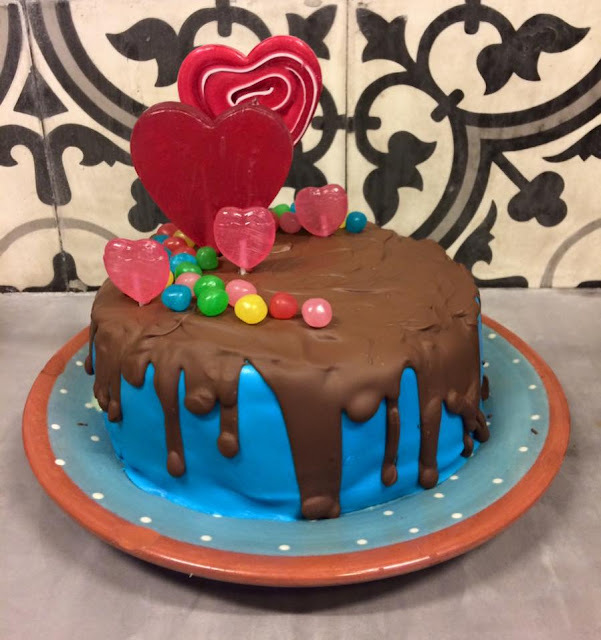 While I was busy making the Lolly Pop Cake, I gave my daughters something to be busy with, too. 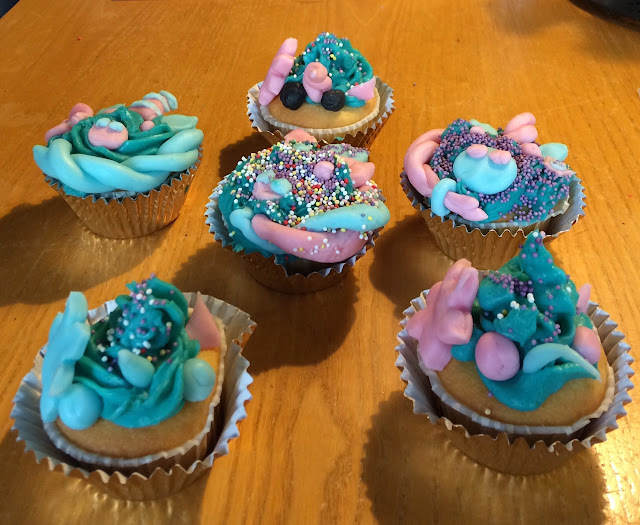 We saw some really cute Unicorn Cupcakes while I was searching for the tutorial about how to make drippings on a cake and of course they really, really, really wanted to make them. They were so proud of what they made and I think they did a really good job. A while ago I saw a tutorial about how to make cake drippings on Pinterest, but didn't pin it. 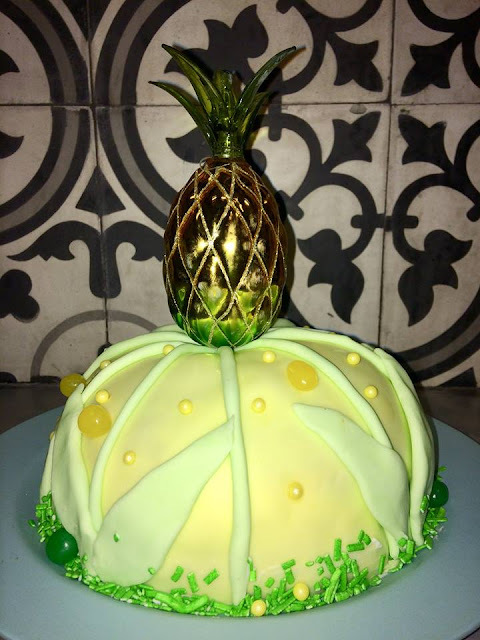 When I tought about it again and searched for it, the most beautiful cakes with dripping came along and I wanted to try to make one myself ever since. Today was the first try out. As you can see I have to fine tune my skills, but for a first attempt I'm not disappointed. I made it for my daughters and as long as there are lolly pops this size involved, they're okay with everything. 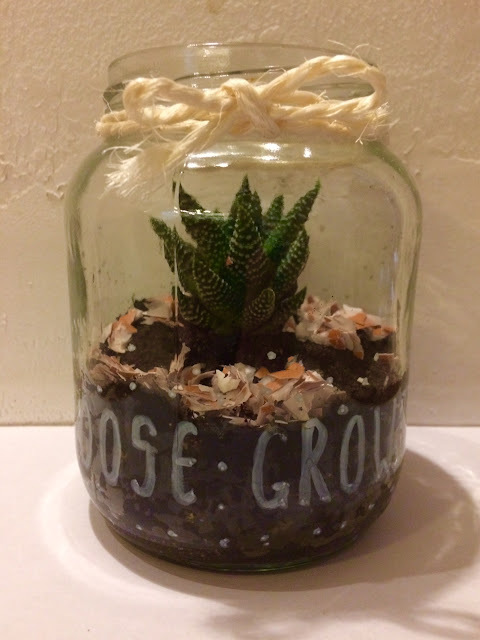 My Mini Terrarium was featured by Pleasures of the NorthWest and by Embracing Change! Thanks a lot, Helen and Stacey! 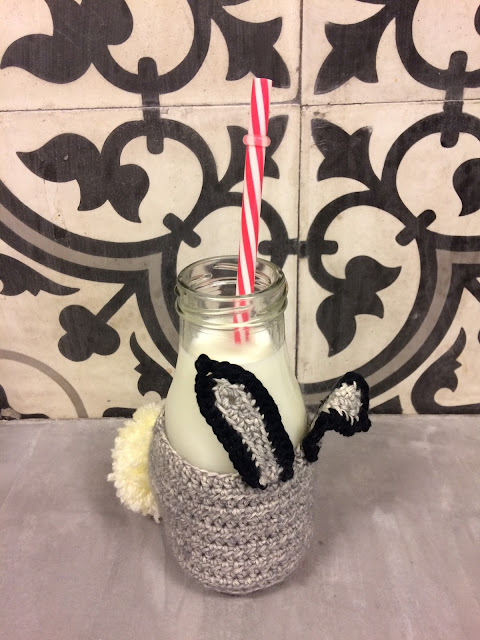 Last week I told you about the Haasje look-a-like mug cozy I planned to make for Easter. 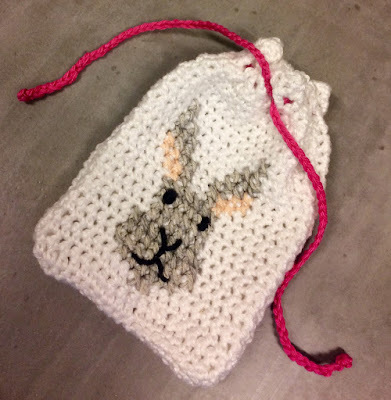 Haasje, our Flemish Giant is my youngest daughter's bunny, so of course she wanted the mug cozy. I had to make it brown, though, just like Haasje. 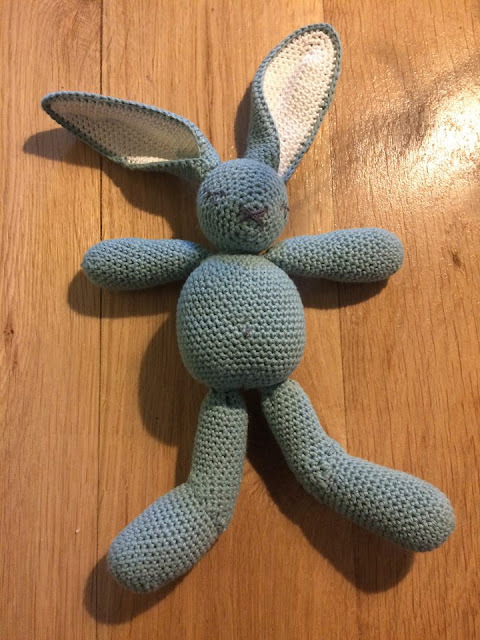 My oldest daughter has a cat, Dolly (yes, named after Dolly Parton, I'm a fan) and after making the bunny mug cozy above for my youngest, I remembered just in time a crochet cat I had pinned a while ago, because she really wants it. It's from Dr Seuss (pattern here). See you next week, together with the cat! I don't know how's the weather in your part of the world, but here in the western corner of Europe, it's pretty cold, so the Easter Bunny still has to wear a shawl and mittens around here. But it looks cute on him, don't you think? 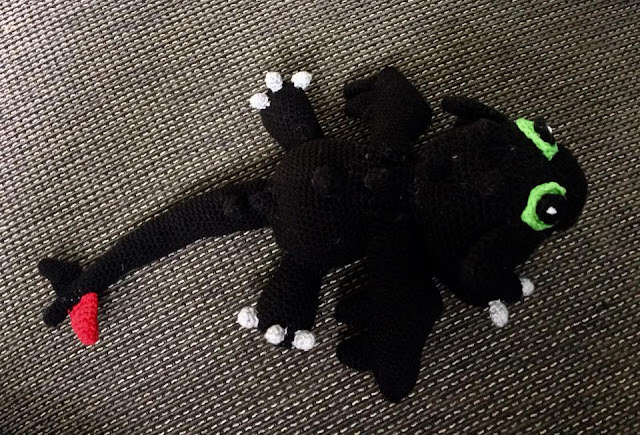 The pattern I found on Amigurumi Today. My Easter Eggs Sack was featured by Life and Linda and by Plucky's Second Thought this week! Since the beginning of this year I stopped with featuring clothes that I would really like to have in 'Wanted' each week, because after five years most things I posted looked like something I had posted before. But of course no longer having the Wanted posts on my blog, doesn't mean there's nothing I want anymore. Of course not. There are lots of things I want! Like those things for example. The other day I was in two stores. One was a house decoration store, where I found the tiniest little plant ever, the other one was an ordinary supermarket, where I bought a jar of green peas and carrots, a vegetable combination my husband likes a lot (and I don't). I cooked the vegetables, rinsed the jar, put a layer of dirt and egg shells in the jar and planted the little plant in it. Tadah! Little terrarium! 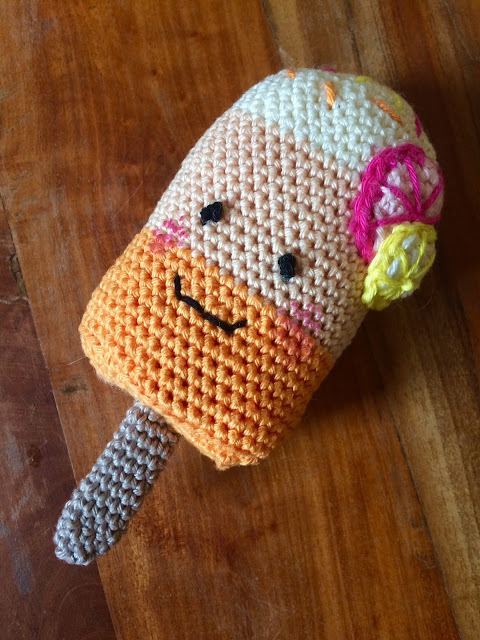 My Ice Lolly Rattler was featured by Creative Jewish Mom! As told last week I would make stone cacti for above the wash basin in one of the bathrooms. Because the real stuff expires after a couple of weeks in my house, making stone cacti seemed a excellent idea. Except I couldn't find stones that looked like cacti. 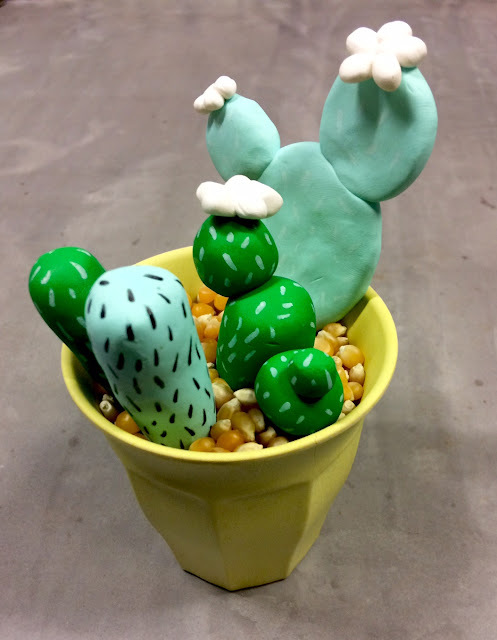 So in the end I bought polymer clay and made cacti out of that, drew spines on it and attached little white flowers. For the little angler of the Angler Fish Pinata I used aluminium wire for strengthening. I had a lot of wire left that I at first didn't know what to do with, because it's too thick for making Wired Letters Postcards. But I made this with it. Did you buy the knitting book from Zeeman already, dear readers from the Netherlands? Then you'll know where these potholders come from! I bought the book a couples of weeks ago and although it cost close to nothing, it's full of funny patterns. Some designs so corny that it's really funny. 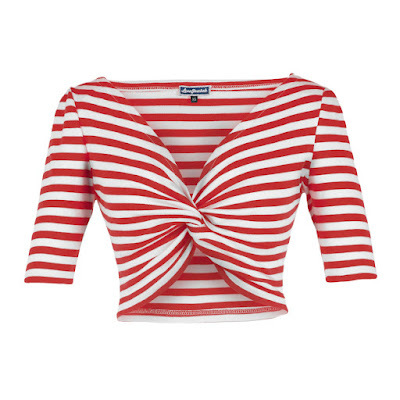 Like the knitted sailor suit for babies. Zeeman meaning sailor man, I think that's quite hilarious. Just as the with spinach besmirch baby that is modeling the suit (Popeye, you got it). All designs are from Club Geluk, famous for their knitted hams and other unusual designs. My Easter Eggs Sack (free pattern!) 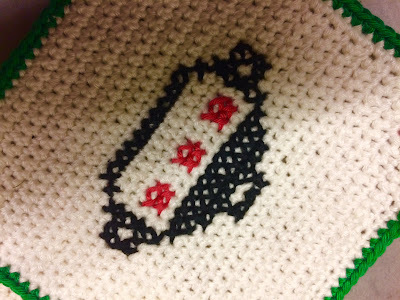 is featured this week by Sew Can Do and Oui Crochet! Thank you so much, Cheryl and Susie! Gunther the Fox (with link to pattern!) was featured by Pattern Paradise, by City of Creative Dreams and by Oombawka Design! Thanks, Maria, Shanice and Rhondda! My husband's cousin has become a father, so reason enough to make some baby presents again. Starting with this Ice Lolly Rattler. The pattern I made up myself while crocheting, but the idea I found here. Gunther the Fox was featured this week by Creative Jewish Mom! 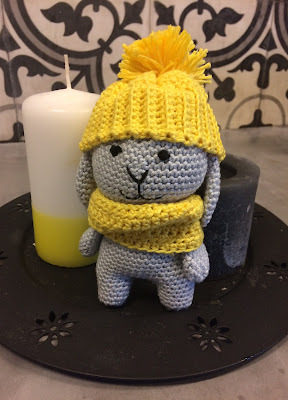 Instead of making the toy in double crochet in one color, I used different colors and used a tapestry pattern, that you can find here.